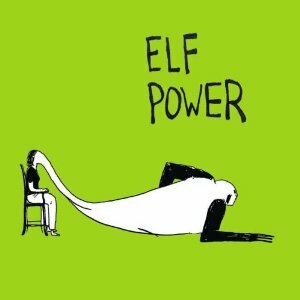 Athens, Georgia-based indie music stalwarts Elf Power have released a strong new CD—their tenth studio album—and are touring. The band’s ethereal psych pop and mystical lyricism remain strikingly original as ever, like some sylvan hybrid of William Butler Yeats and early R.E.M. filtered through The Notorious Byrd Brothers. That’s the good news. The bad, sad news is how sparsely attended their High Noon Saloon show was last Monday night in Madison. A generous estimate would place the “crowd” at around 30 people. But let’s face it: woe unto any Wisconsin public event scheduled the same night as a televised Green Bay Packers-Chicago Bears football game. 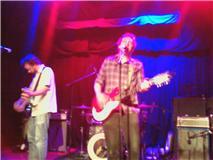 Given the desultory circumstances, Elf Power’s current five-member lineup (lead singer/songwriter Andrew Rieger, bassist Derek Almstead, guitarist Jimmy Hughes, keyboardist Laura Carter, and drummer Eric Harris) gave an engaging, and, at times, inspired performance. Bassist Almstead’s harmonizing vocals didn’t find their sweet spot until a couple of numbers in, but audience sympathy was on his side as he was hobbling to and from stage on crutches from an apparent injury or sprain. Highlights included four standout songs from the new album: “The Taking Under,” “Stranger in the Window,” “Like a Cannonball,” and “Goldmine in the Sun.” And a seemingly out of character but very fun cover of “Junkie Nurse” by Royal Trux. Opening for Elf Power were reverb-drenched Madisonians Icarus Himself, whose Fine Young Cannibals falsetto flourishes from lead Nick Whetro were a rousing rebuke to a shamefully underpopulated night at the High Noon Saloon. Jimmy Hughes and Andrew Rieger of Elf Power performing at the High Noon Saloon, Madison, Wisconsin, Sept. 27, 2010. Photo: Augie McGinnity-Wake.